1. Fixed: Grammarian PRO2 2.0.16 fixes a missing file install issue. 2. Fixed: Additional Grammarian PRO2 Activation and Licenses Window updating issues. 3. New: We added a secure sockets layer security (TLS 1.2, TLS 1.3) protocol into Grammarian PRO2 and the online activation database. This protects the customer's information to and from the customer's computer. This is more added security for our customers. 4. 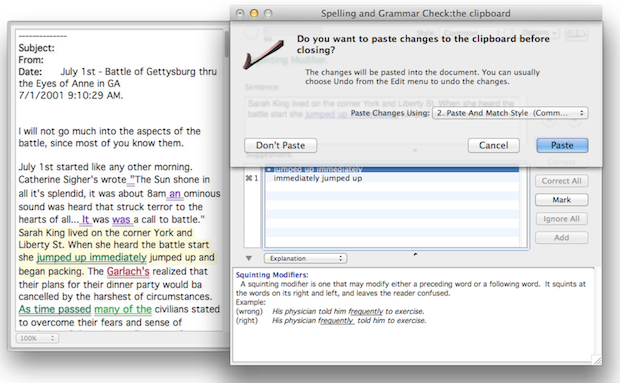 New: Grammarian PRO2 Document Check "Paste Changes" can now automatically "Paste And Match Style". Above: Grammarian PRO2 will perform a paste "Shift-Option-Command-v" combination instead of the conventional "Command-v" paste. Programs such as Microsoft Word 2016 need this to maintain clipboard paste formatting.